It has been claimed, on various occasions, that Anne Boleyn ‘frenchified’ her name by changing it from ‘Bullen’ to ‘Boleyn’, making it less common and more ‘upmarket’ – “Anne Boleyn” versus “Nan Bullen”. This is a myth, however, and is actually to do with the fact that there was no standardized spelling in England at this time. Letter from Anne Boleyn to her father, Thomas Boleyn, while she was at the court of Margaret of Austria c. 1513 – The letter was written in French and was signed “Anna de Boullan”. Commissions of the Peace 1509-1514 – Thomas listed as “Sir Th. Boleyn” and “Sir Thos. Bulleyn”, and his brother listed as “James Bulleyn”. Inscriptions on the brass cross memorials to Thomas Boleyn the Younger and Henry Boleyn, at Penshurst and Hever – Both refer to the boys being sons of “Sir Thomas Bullayen”. However, their father’s tomb has the name spelled “Bullen”. George Wyatt, grandon of Thomas Wyatt, the Poet, spelled the name “boleigne” in his biography of Anne, so there’s another version of the name. I could go on and on finding different variations throughout Letters and Papers etc., as I could with Cromwell (Crumwell), Carey/Carew, Seymour and many other surnames. What I always find funny when reading Tudor documents is that the same word or name can be spelt two different ways in the same sentence, that’s how ‘unstandardized’ the spelling was! As I have mentioned before, we know that the city of Boulogne in France was written as “Boleyn” in the Chronicles of Calais and various other documents, so it may be that the family name “Boleyn” had its origins there – see my article “Anne Boleyn’s Family Tree” for more on this. So, it’s not a case of Anne Boleyn being a snob by changing her name from “Bullen” to “Boleyn”, it’s all down to Tudor spelling, or the lack of it. Anne Boleyn – The Boleyn Family’s Meal Ticket? Interesting — what was Anne’s name doing in the Revels accounts for 1519, just out of curiosity? I thought she was overseas at that time. That’s just what the accounts are called in L&P, they cover the shrovetide joust of 1522 too. I think I’ll go and add that in so it doesn’t cause confusion. I found a painting hanging in one of the castles in England that spells it has Bullen. Then underneath that reads “after Bolbein”. I’ve yet to see that spelling or the explanation of that. Any ideas? More likely it’s after “HOLBEIN”, court painter of the time. (“After” meaning in the style of). Her ancestors were the Counts of Boulogne so he French roots were authentic. It is the Saxonish Bullen that does not seem valid, to me, but understandable after the scandal the later descendants wanted to be incognito so they stuck with Bullen or Bolyen. Interesting article Claire. I may have mentioned on here before that I believe I am a direct descendant of Edward Boleyn, youngest brother of Anne’s father Thomas, but have never been able to trace a death or will for him to prove the connection. This article has reminded me that I am going to have to extend the search to cover all the known variations of the surname and you’ve given plenty to work with. I find it very interesting that even the person themself would spell their name differently. You would think they would at least have some standardized form even when others spelled it phonetically. Takes an awful lot of wildcards to find the name in Dutch databases! I guess for most persons spelling was not important, probably more important was that people understood who was meant. A very useful reminder, Claire. For family researchers like Carolyn and me, the key to making accurate connections is historical awareness. Unquestioningly applying modern assumptions to people of other eras leads to gaping blunders. As you’ve shown, our understanding can be very much affected. It’s not trivial that spelling didn’t become standardized until the nineteenth century, that regional dialects affected it, and that people often varied the spellings even of their own names. (Just try searching the National Archives site if you’re not aware of this!) Likewise, that the connotations of some titles and words–“servant” and “indenture” are examples–were different in the early modern era than they are now. And that many laws and social customs have changed. To approach Anne Boleyn and her contemporaries with any relevance, learn about their society. The difference between “reformer,” “Protestant” and “Puritan,” for example. It isn’t so daunting. Social history and local history are fun, often better than a soap opera! Kudos to the Anne Boleyn Files for doing its part toward furthering this kind of understanding. 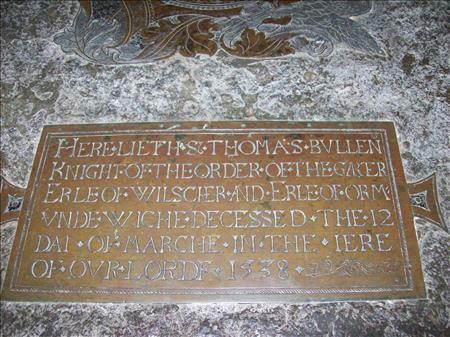 Just for interest sake, on Henry Carey’s tomb in Wesminster Abbey it is spelt ‘Bullen’. Henry Carey was Mary Boleyn’s son and died in 1596. And “Bulleyne” on his sister’s tomb in the abbey! That would be fascinating if Anne was descended from a norman count but the french merchant sounds more plausible since her great grandfather was a London merchant. No standardized spelling was established in England during the Tudor reign. Most names were spelled phonetically, with little or no regard to consistency. Although Anne Boleyn was considered highly educated, she had virtually no reference to ensure the proper grammar, spelling, or punctuation of any texts she left behind. Thus, articles that survived Henry VIII’s destruction of her memory may be contradictory in terms of spelling. “Anna Bolina”,” Anne the Queene,” “Anna Regina,” etc. are in fact indicative of Anne’s place as queen of England. We did a brass rubbing of Thomas Bullen [a very long time ago] when I lived in England. The tomb was in sad disrepair.Sadlly delapadated with crumbling bricks where one could look inside the tomb. Has this state of affairs been remedied, and if so when? We also noticed the difference in spelling at Westminister Abbey. We had quite a nice collection of “spooks” as we referred to them. Interesting way to see England and learn the history of the brasses and the surrounding area. People were every so nice to us brass Americans and very good about booking us in for a “rubbing”. I took a class on British Kings and Queens while there and have been fascinated by Anne Boylen ever since. Thankyou Claire for another informative posting. Stodart, Stodhart, Stodhard, Stothert, Studdert, Stoddard, Studart, Studdard, Studeart, Stiddart, Stodehart, are but some of the spelling of my maiden name Stoddart, which originates pre 9th century. So I would in imagine everybody will be in the same boat when it comes to the evolving alterations their surname has taken over the years. To presume that Anne changed hers to make her sound ‘grand’ was just another dig by those who thought of Anne in a negative way through time and look for every opportunity to debase her. It’s good to see that these myths are being aired and debunked…but I guess there will all ways be those that WANT to believe these falsehoods, but hopefully they will become less and less as time progresses. It seems that most surnames rise from a persons trade, location, geographical characteristics, colours or ‘son of’, etc. Her spelling is good with a capital letter at the beginning of each sentence and at the beginning of her first as well as last name nice and neat. Her writing is better than some people of today just as good if not better than! Hi Clair. My name is Miranda Reed. I have a few questions for you. Um Do you know any websites that would let you find out who lived in irland going by the last name reed or griffith or Kelley? And if your wondering in what year 1500s maybe or 1800s. I just really want to know who my ancestors are. LOL – I was stopped cold with the spelling of my fathers family. How many ways can you spell “Mrnustik”? It is so confusing and then I tried my mothers family because “Wolf” would be easier – not so. Wolf, Wolfe, Woulf, Woulfe, and other ways and all this in the 1800’s because the Wolf side of the family was Native American! I can only imagine what I’d find if the Wolf’s came from England! Thank you for this. I am working on my family tree and had run into a dead end once I got as far back as early 1600s, late 1500s for the English side. Now I know to broaden my search a little with different spellings… Thanks! Because you can’t blindly trust others to spell your name as you do. That’s why I reverted to my middle name years ago to get away from having to spell Tabatha every time I had to leave my name for something. Would it be far fetched for the Boleyn name be associated with Bolinger? I am researching and have (unconfirmed) information that my ancestry is through Mary Boleyn. I would love to hear from someone with knowledge on the subject. Many thanks and I am so enjoying the site. Today I visited Hever Castle her childhood home and it was spelled Bullen. Very interesting article. I’m from the States and have only seen it spelled Boelyn up to this point. If you are in England I highly recommend visiting. My own family surname has been spelt three or four different ways and the English definitely can’t pronounce it properly. It also depends on if you use the Scots or Gaelic. MacMahon, McMahon, even MacMaharn or Mahone or even M’cMahon. We use McMahon, but as you can imagine it has varied. I assumed the Family name BULLEN came from the Family Coat of Arms which shows Three Bulls – (unable to attach the image). The Boleyns coat of arms if I remember right have three or four bulls so the name bullen probably comes from that.